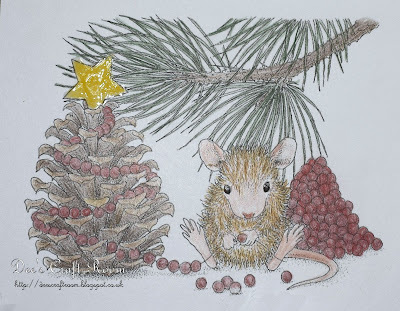 I think the House-Mouse range is adorable and last year I bought several new stamps to add to my collection, this cute little mouse decorating him pine cone was one of them. You will not be surprized to hear that this image is called 'Pinecone Tree'. 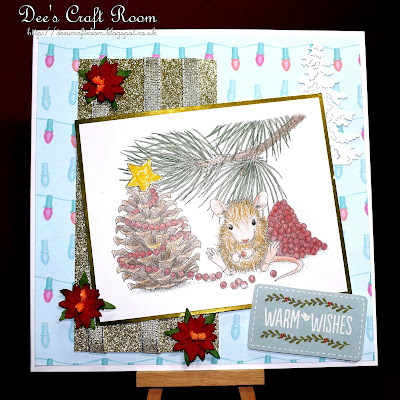 The backing paper came from one of my Housemouse CDs and the little flowers are from Wild Orchid Crafts and the sentiment is from a 'Me to You' paper stack. I coloured the image with my polychromos pencils and mounted it on some gold card. Finally, I added some Glossy Accents to the star to make is catch the light.